by Woods, Thomas E. Jr. The winners write the history, and the winning states especially so. Thomas Woods, however, sets out to write a primer on American history from a different point of view, one that doesn't glorify centralization and intervention. The result is the only primer on American history that is heavily informed by the economics of the Austrian School. It was also a New York Times bestseller and one of the most controversial books in American history to appear in decades. From the Puritans through the drafting of the Constitution, the Civil War, the World Wars, the rise of the "Great Society" all the way up through the of the Clinton Administration, this brightly written book discusses the real ideals of the founding, the truth about the Civil War, the heroism of the robber barrons, the ravages of statism in World War I, high taxes, and the war against free markets. "I think every high school and college teacher of U.S. history should have their students read the chapter in your book dealing with whatever period they are covering," says Bettina Greaves, "plus the books they 'are not supposed to read.'" He shows that the Constitution was never understood to be a permanent union, that big government caused the North-South conflict, that Alexander Hamilton's friends were racketeers, that the US didn't have to enter WW I, that Hoover was a big government conservative, that FDR made the Depression worse, that there really were Communists in government, that FDR made WW II inevitable, that the Marshall Plan was a flop, that the Civil Rights movement increased social conflict and made everyone worse off, that unions made workers poorer, that the 80s weren't really the decade of greed, that Clinton's wars were aggressive and avoidable, and that his personal issues were a major distraction from the real problems of the 1990s. Thomas Woods studied under Rothbard before completing his PhD at Columbia. He writes in a Rothbardian spirit, combining scholarship, radicalism, and a burning desire to communicate. Even from the first pages, when Woods is describing the religious and ideological demographics of the Colonial Period, the reader is aware that he is being taught by a master who loves his subject. He prose burns with a passion to tell the next thing. Rarely do two or three sentences pass when he is not surprising you with a new insight. He is glad he has your attention and does not intend to let it go. So long as you are reading, Woods is going to make sure you get his point and come to believe it. 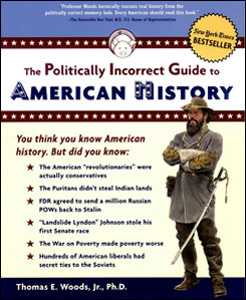 This book was marketed by the publisher to a conservative audience (e.g. the title alone), but what readers actually find is a radical reinterpretation of the whole American experience from a Jeffersonian-Rothbardian point of view. <p "The book is no mere compilation of surprising facts. Woods has rather organized his account around a central theme. Americans have, from the colonial period to the present, flourished so long as they lived in a free economy, accompanied by a government strictly limited in powers. But throughout much of our history, the efforts of Americans to live freely have confronted a formidable enemy: the Leviathan state. Woods shows that the federal government, far from being the protector of the rights of minorities, has been the main obstacle on the path to liberty." -- David Gordon, The Mises Review. Woods has written a bracing and indispensible book. It's no wonder that Amazon.com has 177 reviews of this book online, with reviewers battling it out with a fury. It has also been subjected to incredible calumny. See what all the fuss is about! I have a masters degree in communications and instructional development. I have conducted research for global institutions. I have taught for 7 years. Thank God for Dr. Woods. It is about time scholars started using original source material in history texts. This book is VERY WELL REFERENCED. The references are in the body of the text, there are copious endnotes, and a thorough index. In this day and age, with the internet, all anyone has to do is search to locate original source material. I was delighted to locate the original text of the Fourth Lincoln-Douglas Debate at www.archives.org, and to find that Dr. Woods' quote was 100% accurate. THIS IS AN IDEAL TEXT FOR EDUCATORS WHO WANT TO LEARN THE TRUTH BEFORE INSTRUCTING THEIR STUDENTS. THE NEXT STEP IS READ THE GREAT BOOKS. DR. WOODS, WOULD YOU PLEASE TACKLE NEXT THE TRUTH ABOUT JEAN-JACQUES ROUSSEAU? I read this entire book in one sitting. Having read much of Woods' work before, I was very familiar with the style of delivery and the quality of scholarship. This book captivated me until the last page, where I promptly noted that this book is five years old; therefore, I was cheated five more years of history to read! However, thanks to the Mises Institute and Lew Rockwell's site, I probably am up to speed on the last five years. I would recommend this book to anyone who loves history and anyone who, through truth and honest scholarship, wants to champion the cause of liberty. I, too, noticed, however, that there were no footnotes. I would have like to have them, but I understand the scope. I think it works the way it is, but it can definitely be an easy way to "discredit" the information found there as "conservative anti-intellectual" vitriol. Regardless, I loved this book, and have within 24 hours of opening its cover, read it and passed it on to be enjoyed by others. This book was great. It's well written and very interesting. My only quibble is that NOTHING is referenced with footnotes. You can pull out a really interesting fact about American history that you've never seen, but you can't find out the source. This severely detracts from the credibility of this book. He does have a bibliography, but that is little help when you're looking for something specific. I hope that they'll put together a revision and footnote all of their references. I'll buy it! The master teacher of American economic history covers money and banking, in a complete revision of the standard account. Can you really understand American history without understanding economics? Thomas Woods doesn't think so. Tom Woods demolishes some of the toughest critics of libertarianism in his trademark way.